Danielle Walker’s Sausage Breakfast Casserole recipe is definitely a keeper. I’m a long-time fan of Danielle Walker. I’ve been a follower of Danielle Walker’s cooking ever since her first cookbook when I found her as part of the Paleo scene. Being a CrossFit athlete, Paleo eating is par for the course. If you CrossFit, you know what Paleo is. Nowadays Paleo eating has become more and more mainstream. Danielle’s recipes aren’t strictly Paleo, but they are designed with gut health and anti-inflammation in mind. Her recipes fit perfectly into the Whole 30 and Paleo crowds. I love her approach to eating mostly whole foods. She’s also done a great job putting together some really delicious baked goods and bread that are allergy friendly. Making baked goods that are gluten free, dairy free, and actually edible is no small feat. I bought Danielle’s very first cookbook right when it came out and I have used it almost weekly for about a year. It’s so well written and all of the recipes are completely solid. Each one as delicious as the next. While I’m not gluten-intolerant per se, I’m a big believer in the idea that gluten should be something that we limit in our diet. I subscribe to the ‘IS IT WORTH IT?’ philosophy of eating gluten. When I eat a lot of gluten-laden food my performance seriously suffers, I feel less flexible, and my joints seem achier. However, I do at times find something that I know isn’t the best choice but qualifies as WORTH IT! Moderation is key. This Holiday Season I want to take the opportunity to review her Third cookbook. Celebrations. Celebrations is a recipe collection that is grain-free, dairy-free. However, Danielle takes things a little further by addressing recipes for those following even stricter protocol like egg-free, nut-free and even the SCD/Gaps diet. If you are dealing with food allergies or sensitivities, there’s a recipe in here for you. There are suggestions to modify recipes to accommodate almost any food allergy or intolerance. Everything is organized beautifully with a handy table in the back that allows you to make quick work of finding what you need. Cooking for family and friends that may have a wide range of dietary concerns can make holiday cooking stressful. This cookbook will take care of that for you. And because the recipes are actually tasty, you won’t feel like you are serving a substandard holiday dinner just because it’s gluten-free. 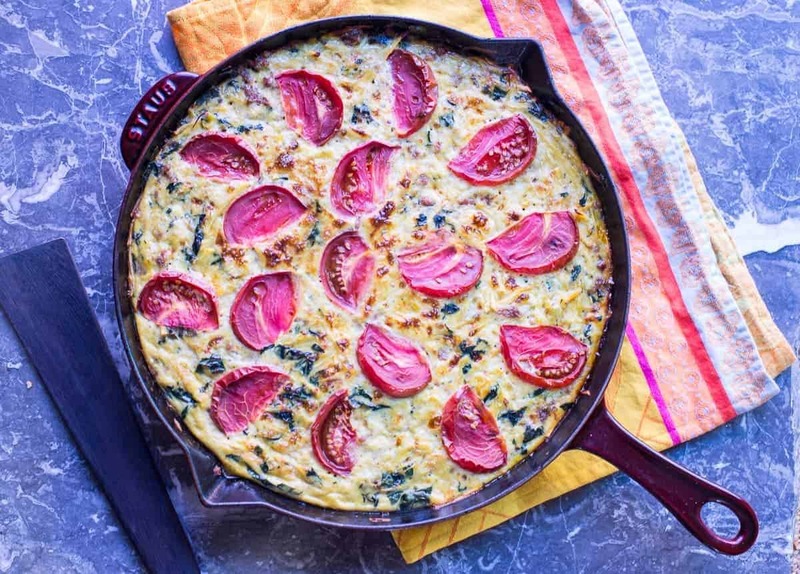 This grain free and dairy free breakfast casserole is from page 271 of ‘Danielle Walker’s Celebrations’ cookbook. 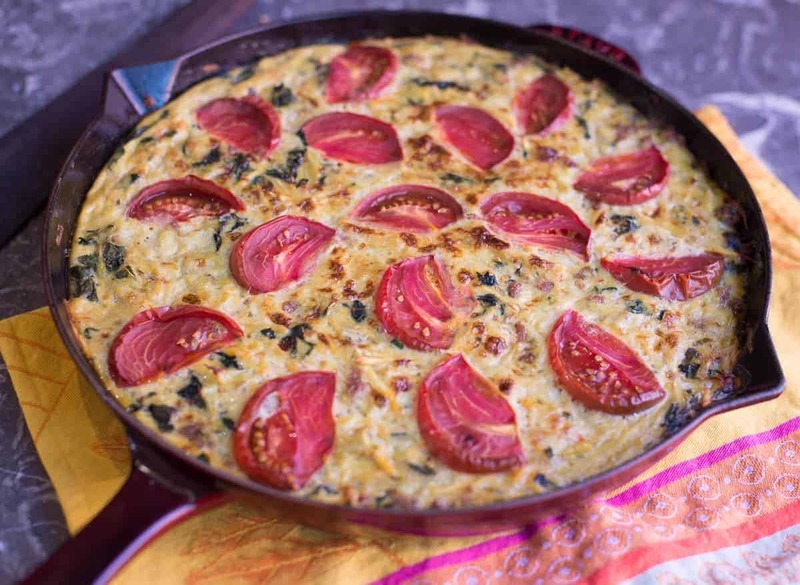 This casserole was fantastic – it has all the feel of a really good frittata. Because it is baked like a casserole it’s also super easy, and you can even prep it up to two days before you have to cook it. How easy is that, especially during the holidays?! The combination of the sweet Italian sausage and the white sweet potato is really delicious. I found this dish filling, satisfying – and best of all – you won’t feel like you are missing out on anything at all. I highly recommend this cookbook, and hope you enjoy this Sausage Breakfast Casserole as much as I did! Do you love cookbook review? Leave your favorite cookbook below. We would love to check it out! Sign up to receive our twice-weekly emails! Don’t miss a recipe. 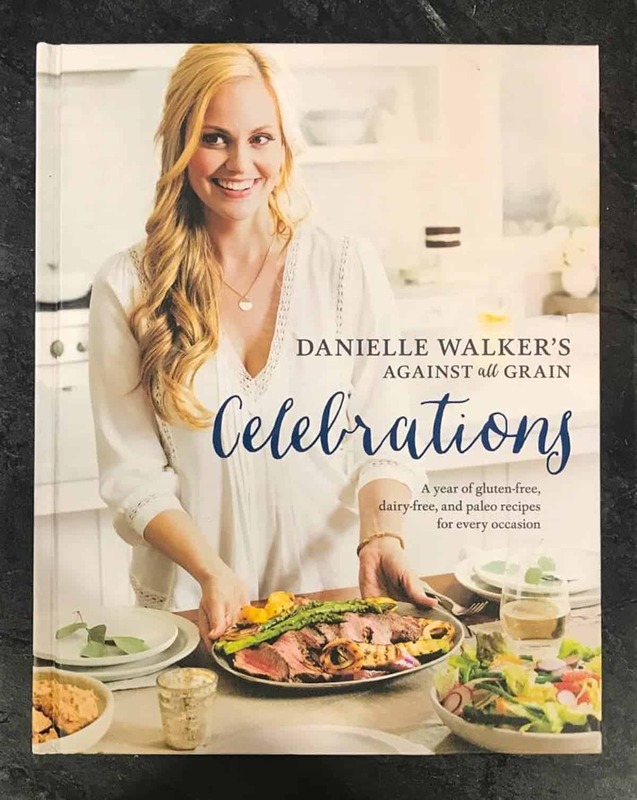 From page 271 of Danielle Walkers Celebrations Cookbook. In a cast iron skillet, cook the sausage over medium heat until browned and mostly cooked through, about 8 minutes. Add the kale and continue cooking for 5 minutes more. Remove from pan and drain the sausage mixture. Discard most of the grease and then return the sausage mixture to the pan. In a large bowl whisk together the eggs, coconut milk, basil, parsley, thyme, salt, and pepper. Stir in the sweet potatoes. Pour the mixture into the pan with the sausage and kale. Place tomatoes slices over the top of the casserole. Remove foil and continue to bake for another 15 minutes, or until center is set. Make Ahead: Prepare the casserole up to 2 days in advance. Cover and store in the refrigerator until ready to bake. Tidbits: Chicken, pork, turkey, or beef sausage can be used. Look for sausage that is nitrate free and does not have additives or sugars. I like Hanna sweet potatoes for their mildly sweet white flesh, but any variety will do. Substitute celery root for sweet potatoes for a lower carb dish. If you tolerate dairy, mixing 1 cup of grated Gruyere cheese in with the eggs take this dish to the next level.